Hello Kitty fans will love this Hello Kitty folding scooter with its pink steel frame and Hello Kitty graphics! 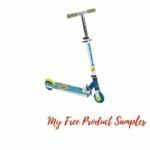 Walmart has Hello Kitty Folding Scooter for $10.00 (Reg $15.00). Choose in-store pick up to save on shipping charges.